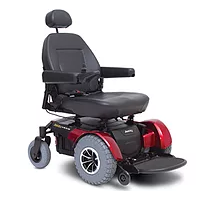 Power wheelchairs are a suitable option for those who are unable to self propel a manual wheelchair. Power wheelchairs allow users of every strength to control their electric wheelchair with the joystick. They can be ordered in a variety of different sizes and colours. Mobility scooters are an electric powered method of transportation. They come in a variety of different sizes and have different ranges in distance and battery life.